Alara was our first taste of Mythic Rares. It was also our first major shakeup of the colour pie since Future Sight, a time when those ideas tested in that previous set were made to bear the burden of an entire expansion. Now, multicolour sets are a pretty cute way to shift some stuff around – you can print cards with a few mutual abilities and see if they play together interestingly, see if they work, and if they don’t really work, you can just let them go, because the other colour could be seen as doing the lifting. Shard of Alara was also one of the first places we got a modern look at three-colour design. There were a lot of characters who were generically gold, but triple coloured cards didn’t have a strong identity so far. Alara is where we had that stuff encoded for the new, for the now. First of all, Shards of Alara got to be the modern reboot of a lot of Invasion-era principles. This is the set filled to the gills with good, useful utility effects in every colour combination outside of the actual wedges. This set has tools for everyone, and if you’re in a colour pairing, have a glance at Alara block to see if it’s hiding some spicy tech for you. Particularly of note is that this brought three-colour tap lands and obelisks, the Ultimatums, a cycle of 3-mana shard creatures (Wooly Thoctar, Sprouting Thrinax, Windwright Mage, Sedraxis Specter and Rhox War Monk) that are all squarely ‘good’ in their colour combinations, giving something that those colours of decks usually want. It has some great commanders like Rafiq of the Many and Sharuum of the Hegemon. It has a range of 2-mana spells for a variety of decks: Jhessian Infiltrator, Steward of Valeron, Tidehollow Sculler, Swerve and Hindering Light. Let’s not forget Mycolith, a card I keep trying to make work in commander, despite everything, and Fleshbag Marauder, the diabolic edict on legs. Hissing Iguanar is a reason to play red aristocrats, too. It also has a cycle of some of the best charms in Magic, a revisitation of the old Invasion-era charms, but much better. I’d pick them all, but the charm that I’ve most consistantly stuck into decks? 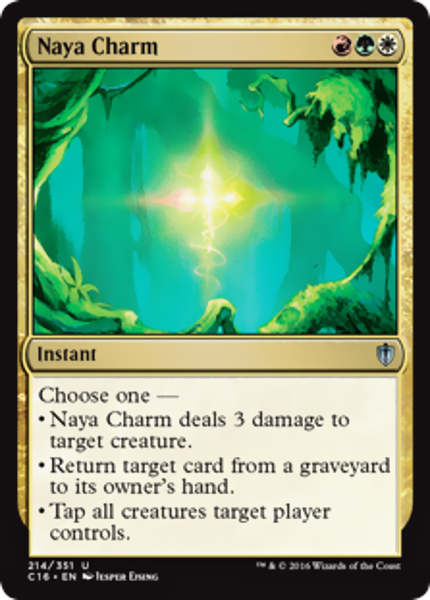 Naya Charm is the last alphabetically of the cycle (Bant Charm, Esper Charm, Grixis Charm, Jund Charm), and probably the least of them in overall competitive impact (indeed, they almost go in alphabetical order), but it’s the kind of card I love. It’s a removal spell, an instant-speed regrowth, a falter and a time walk depending on what your opponent’s playing. After I lost Eternal Witness, I looked to Naya Charm to fill its space and you know, in some ways it did the job okay. Conflux is a bit of a squeezed middle set. There’s definitely stuff in it, but most of that stuff isn’t as lasting or flexible as other sets offer. There are a lot of cycles that are kind of boring like the Protection From bears. Not to say there isn’t some sinew in here! There’s a cycle of Basic Landcyclers, which are all perfectly acceptable ways to get land-search in your decks that also maybe, sometimes, if you must, can get played late game. There’s a trio of cards that when you pump WUBRG into them become pretty threatening, a thing you can do more readily now we have cards like Painted Bluffs in modern. Paleoloth is an odd card. It doesn’t trigger off itself, which is a little bit out of type for the Naya Gargantua. The others mostly do care about impacting themselves, but I guess ‘6 mana 5/5 eternal witness’ was considered a bit stiff (though they were happy printing a 6 mana 3/6 one). Also the ‘loth only regrows creature cards, which is I suppose an attempt to keep him from being too good. Yet, don’t sell it short; it’s still a big creature, it has a well-supported creature type, and it has some pleasant oddball interactions. It can retrieve Evoke creatures, for example, which are happy to jump back into the graveyard. It can trigger off copying effects, too, and generates value off cycled early-game threats. 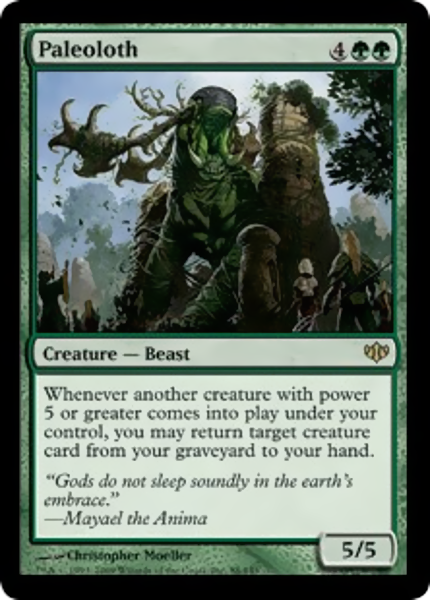 It even interacts with oddball cards like Crocodile of the Crossing and Plague Belcher, and even if you’re into that kind of spice, Groundbreaker. Paleoloth is just a little bit awkward to keep from going over the top. I think that’s what makes it a pet card. I keep trying it and keep cutting it, and almost every time it’s good, Woodland Bellower could have done the same job. Still, why not give it another try, huh? In addition to the Borderpost cycle, a sort-of-neat manafixing option for the budgety or people who, for some reason, really need a 1-mana coloured spell they can cast for generic mana (hi Quirion Dryad), Alara Reborn also has a few favourites. Remember Putrid Leech, who let you crash in with mana up and present your opponent with the hard-to-solve puzzle of what to do? How about Deathbringer Thoctar, mighty Aristocrat liege that it is. Goblin Sharpshooter was cool, but it’s cooler on a big stompy beast that gets bigger. 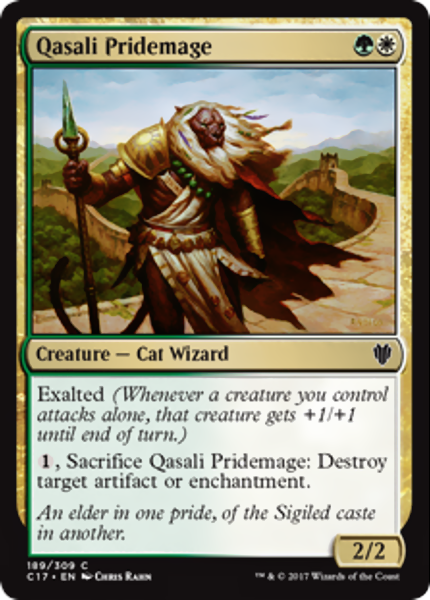 Qasali Pridemage is a fascinating card to play with and play well. I played it in a Quirion Dryad gro deck a little while ago, and as a followup to the dryad, giving a creature +2/+2 on the attack while keeping mana open to remove things is pretty hot. It can even make an admirable showing of being a Watchwolf on its own. When you drop a second one, the math gets a little squiffy – is it better to serve with two, or with one 4/4? That’ll depend on your opponent’s board. Naturalize effects are common in green and you’ll always find one that works best for you. Me, I like this one that costs 3 when I need it but sometimes attacks and blocks.